LG Display said Thursday that the company has raised 20 billion yuan ($2.91 billion) in syndicated loans with Chinese banks to finance the construction of its organic light-emitting diode plant in Guangzhou. The panel-maker said its Chief Financial Officer Kim Sang-don met on Wednesday with officials from the China Construction Bank, the Bank of Communication, the Agricultural Bank of China and the Bank of China to ink the deal. Considering that it is a syndicated loan, the lenders provided the loan to the South Korean company under the same conditions for the next eight years at favorable interest rates. 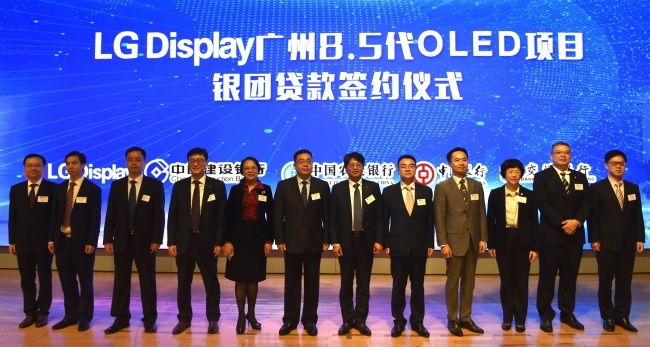 The funds will be used for LG Display High-Tech Co. in Guangzhou, which is currently constructing an 8.5-generation OLED production line. The new plant is slated to begin mass production in the second half of next year.